When I began Fifty Two Foods, there were a few foods I knew I would include. Some of those, such as walnuts, I covered early. Others, like cherries, I needed to wait on until they were in season. This week’s food, pork belly, was another that I knew I would cook from the very start, and while it has been readily available, I’ve held off cooking it, because I really wanted to get it right. Towards this end, I took a first run at it a few weeks ago, and much like collard greens, I learned a few things that have informed my second attempt—a slab of pork belly that is in the oven as I write this. I’ve enjoyed lots of pork belly in the last couple years, thanks to what seems to be a love affair between it and Portland’s new crop of chefs. One of my favorite preparations comes courtesy of Beaker & Flask, where it is served as a large, tender steak nestled among an ever-changing line-up of vegetables and fruits (my favorite was cabbage and pomegranate, if I recall correctly). 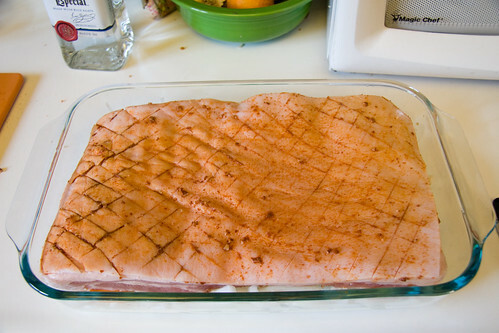 This is, in my mind, the high watermark of pork belly. Soft and charred, with fat that melts away and flavor the veggies below. I won’t aspire to achieve this so early in my pork belly career, but keeping it in mind will hopefully guide me towards my perfect home cooked belly. 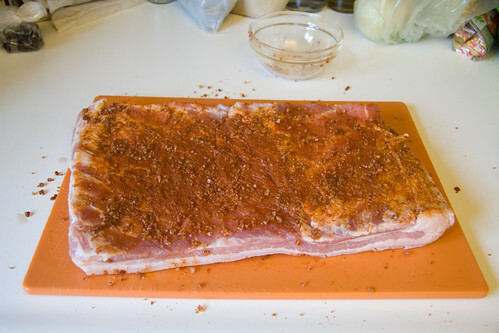 I rubbed spices on both the skin and meat sides of the pork. 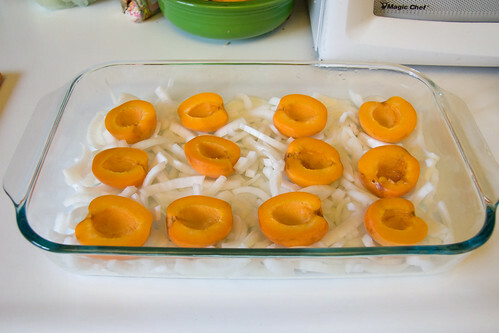 I set the pork on a layer of onions and apricots. I’m cooking it much longer, 5-6 hours, than last time. 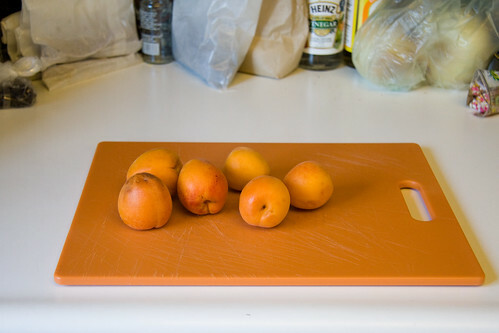 My apricots are Royal Blenheims from SunBlest Orchards in Patterson, CA. SunBlest’s representative at the Davis Farmers’ Market is consistently one of the cheeriest vendors, always good for a big smile and often a friendly comment or two. I was more than happy to pickup 2 pounds of apricots, especially after he gave us a sample—a perfect balance of sweet and tart—that confirmed apricot season has arrived. 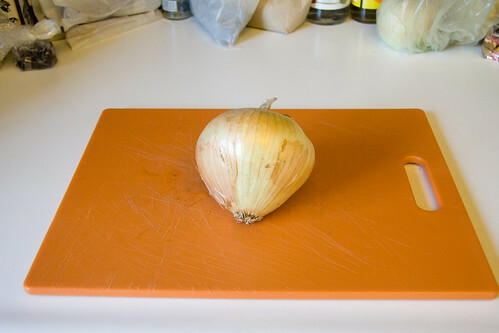 I quartered a large, yellow onion, then sliced it into thin strips. 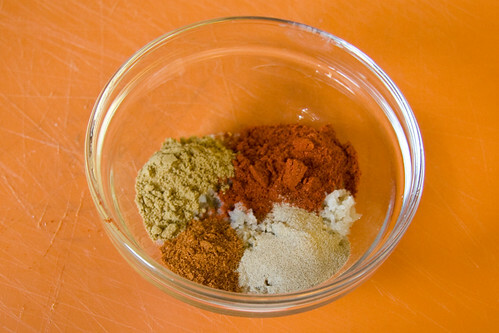 I made a spice rub of salt, paprika, cumin and white and cayenne peppers. 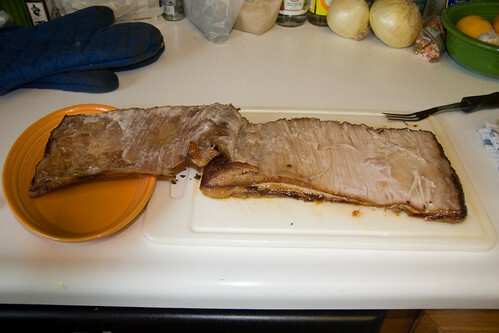 My pork belly, as before, came from the Bledsoe Meats, in Woodland, CA, surely the nearest and best pork producer to Davis. 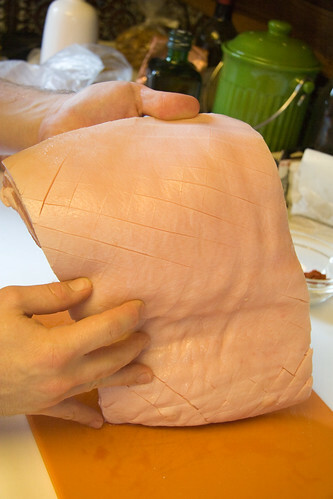 It’s a 3+ pound slab of hog, with the skin intact. Sitting on the cutting board it was pure pork potential—ready to be slow roasted or made into bacon, pancetta or another smoked marvel. 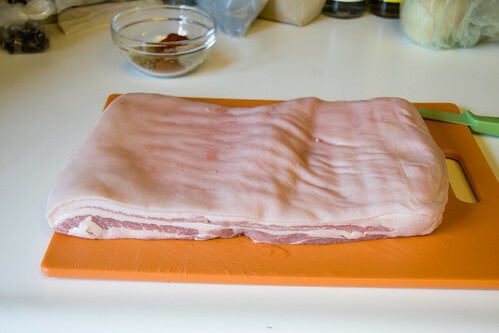 I scored the skin on both diagonals, so the fat could bubble up and create crispy cracklings. 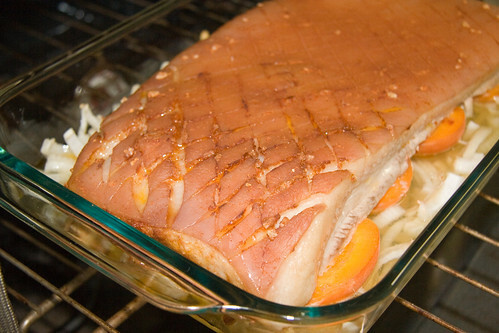 I covered both sides of the pork belly with my spice rub and laid it atop the apricots and onions, which were doused with a helping of silver tequila to keep things moist. Then I placed the pan in the oven to cook slowly at 250°F. Update at 5pm: Just passed the three hour mark, and I’m kind of shocked that this was about when the last pork belly came out. The skin is definitely starting to get crispy, and a lot of fat has melted out to mix with the tequila, apricot and onions. It took about an hour for the fat to start melting. 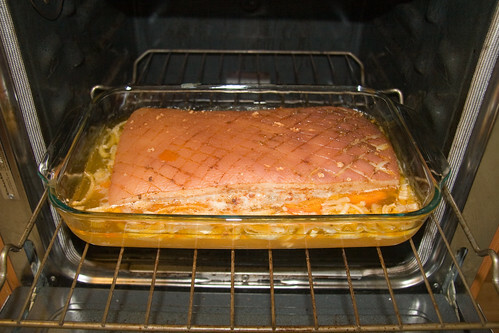 Then another half hour before there was evidence of cracklings forming. I’ve raised the oven temperature to 275° to encourage it to cook a little faster, and to make sure the fat simmers enough to keep basting the pork. Update at 10:30pm: The pork belly took about five and a half hours to complete. I pulled it out around 7:30, and the moment I peeled the skin off the meat, I could tell it was a success. Great roasted pork belly tends to pull apart along the muscle grain, and this was definitely happening. 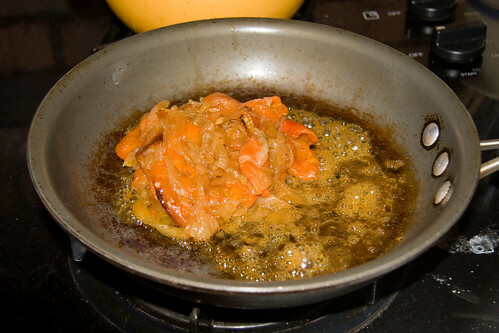 I strained the apricots and onions out of the roasting pan, and put them in a skillet on the stove to make a chutney to go alongside the pork. Much of the spice was in this mixture, so it made a wonderful and very welcome complement to the belly, which had taken some of the flavor, but was still relatively lightly spiced. 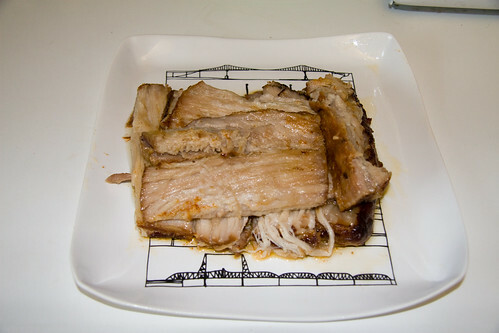 I cut the pork belly into inch and a half wide slices and layered them on a platter to serve. The skin had a nice snap to it, but I wanted to get it a little crisper, so I threw it back in the oven for a few minutes. 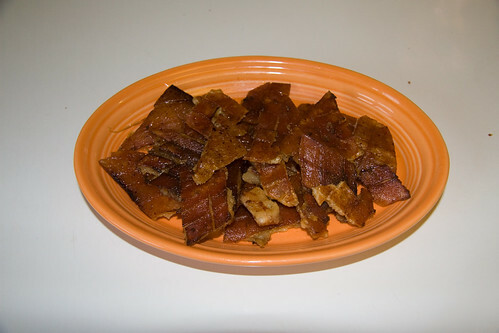 Five minutes later, I had wonderfully crisp, but still slightly toothsome pork cracklings to serve alongside the pork belly. They were very well spiced from the rub.